A deep pore-cleansing facial that is designed especially for your skin type that will leave your skin refreshed and restored. This facial includes exfoliation, steam, extractions and finishes with a soothing masque leaving your skin nourished and hydrated. Oxygen is extremely beneficial for anyone’s skin as it helps to restore balance to the skin. The skin will glow as blood circulation is increased, pigmentation is lightened and pores thoroughly cleansed. The Enzyme Facial will dissolve dead skin cells, open pores for easy extractions and is followed by an upper body massage and rejuvenating masque. Our aestheticians will choose an enzyme that is best suited for your skin type. As our skin ages, our cell turnover slows down therefore giving the skin a dull, lifeless appearance. This treatment helps that process along by stimulating collagen-elastin synthesis and microcirculation. The skin will regain elasticity, suppleness, hydration and cellular regeneration. This treatment incudes a deep pore cleansing to help remove trapped dirt, oil & dead skin. Extractions are a must in this treatment & will prevent breakouts. 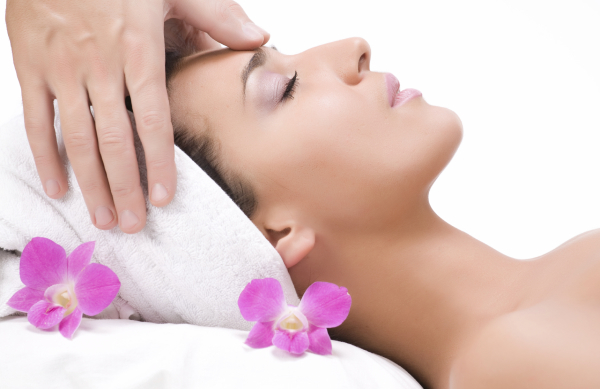 A light chemical peel is used sometimes to clear the skin. Treat your back to a deep pore cleansing treatment. The back, which is often neglected, will be left soft, smooth and ready to bare. LED Therapy is a light application of light energy to the skin. Therapeutic benefits are: smoothes skin texture, kills bacteria, increases local blood circulation and stimulates collagen production. This helps with symptoms such as sinus, edema and soreness caused by congested lymph pathways. For best results, hair should be at least ¼ inch long. We regret that we cannot perform waxing services on clients who are using prescription exfoliates, or who are taking Accutane or antibiotics due to the sensitivity these products cause to the skin. Please allow 24 hours before sun bathing or indoor tanning after waxing. This peel is used in treating acene prone skin, oily skin, large pores and blackheads. This peel will help with large pores by reducing and rebalancing oil prduction and improve skin texture. Jessner Peel...........................................$120+ This peel removes superficial layers of skin, dries out active acne, dislodges blackheads, reduces shallow wrinkling & scarring. It also helps brighten hyperpigmentation & improves the overall appearance of sun damaged, acne prone & aging skin. TCA Peels help treat pigmentation, discoloration, fine lines & aging grooves. TCA is used as a skin resurfacing agent to remove layers of skin, thereby allowing newer refreshed skin to grow in its place. 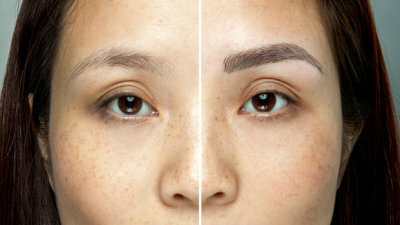 ​​Microblading is a new semi-permanent tattoo technique that fills brows out or reshapes them by drawing on tiny lines that look like individual hairs. The first appointment may take up to 2 hours, while touch ups take about 40mins. Clients are advised to come in 4-6 weeks after the initial appointment, then once a year after that. ​*Consultation Required.............$50 non-refundable & or applied to your Microblading Service. Microblading must be scheduled WEDNESDAY, THURSDAY, or FRIDAY MORNINGS....With Kimberly Tait Only! Microdermabrasion is a procedure that utilizes crystals to gently resurface the superficial layers of the skin. A series of treatments will help minimize fine lines, scars, sun damage, active acne and hyperpigmentation. *Microdermabrasion series packages are available for additional savings! Wake-up with perfect makeup perfectly applied everyday. We use the Nouveau Contour tattoo machine that is state of the art, computerized technology. This machine calculates the best needle frequency needed to achieve optimal pigment retention. *Consultation Required.............$50 non-refundable & applied to your Permanent Make-up Service. PM Brows........................Prices start at $350 to $485. PM Lip..............................Prices start at $350 to $485. PM Eyeliner.....................Prices start at $350 to $485. Permanent Make must be scheduled WEDNESDAY, THURSDAY, or FRIDAY MORNINGS....With Kimberly Tait Only! This treatment removes dead skin cells and also facial hair. It is great on rough, dry skin, and acne scarring. This treatment results in a refined smooth glowing apperance. This is a wonderful form of exfoliation that can be used with or without chemical peels. ​Please arrive 10 minutes prior to your appointment. We schedule appointments according to our specialists’ availability and specialty. If you are running late, please let us know and we will do our best to accommodate you. Arriving late will likely limit the time allocated for your service; it will lessen the effectiveness and most importantly your pleasure and enjoyment. Zolton's also requests a 24 hour cancellation notice to reschedule or cancel your appointment. Please allow 24 hours to avoid a $75 re-booking/cancellation fee. Thank you for your consideration and understanding. Gratuities are not included in the price of services and are greatly appreciated. Suggestions are always welcome.